There have been 125 images uploaded to this topic. (View topic image gallery). There are 167 posts in this topic. You are on page 1 of 4. New to the hobby, I jumped in with both feet by deciding to do a full retheme on a 1968 Williams Student Prince. After getting some feedback, I will also be adding a circle of thin lexan under the bottom of the caps that sticks out about 1/16" to take any hits from air balls. Hardsuit last edited this post 1 year ago. Wow! Are you kidding me?! That looks amazing! How far are you going with the retheme? 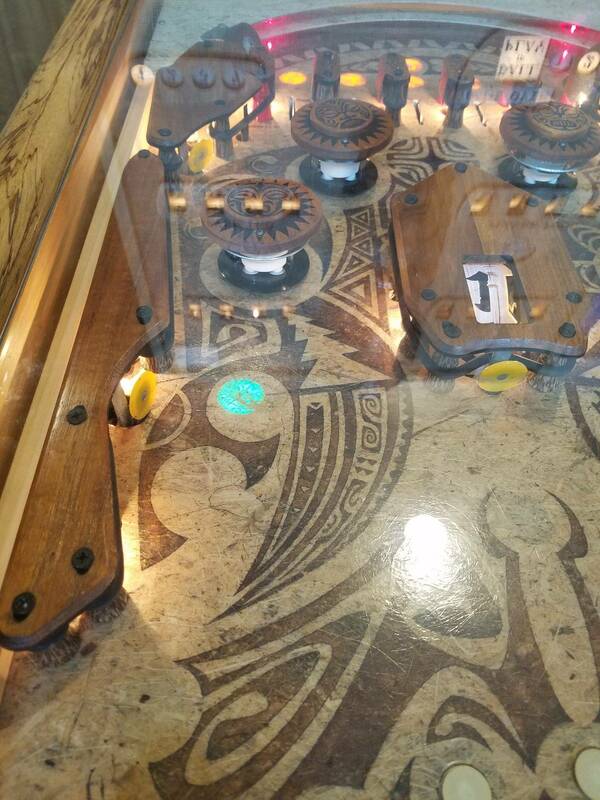 Playfield art? Back glass? Everything. 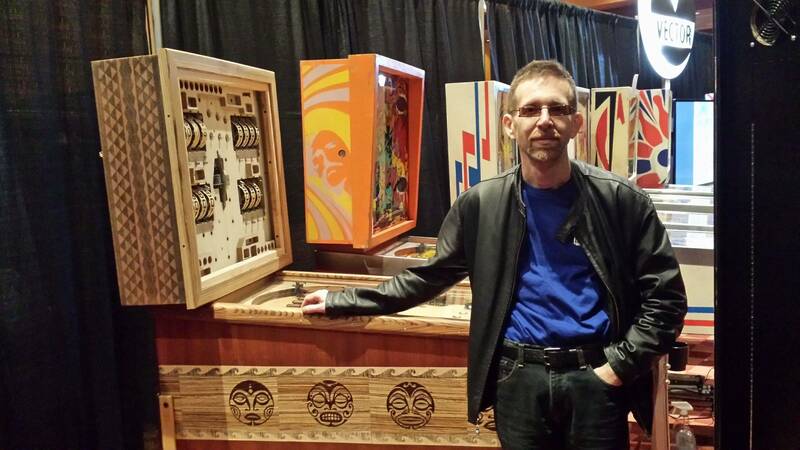 Full retheme of playfield, plastics, cabinet artwork, and backglass. 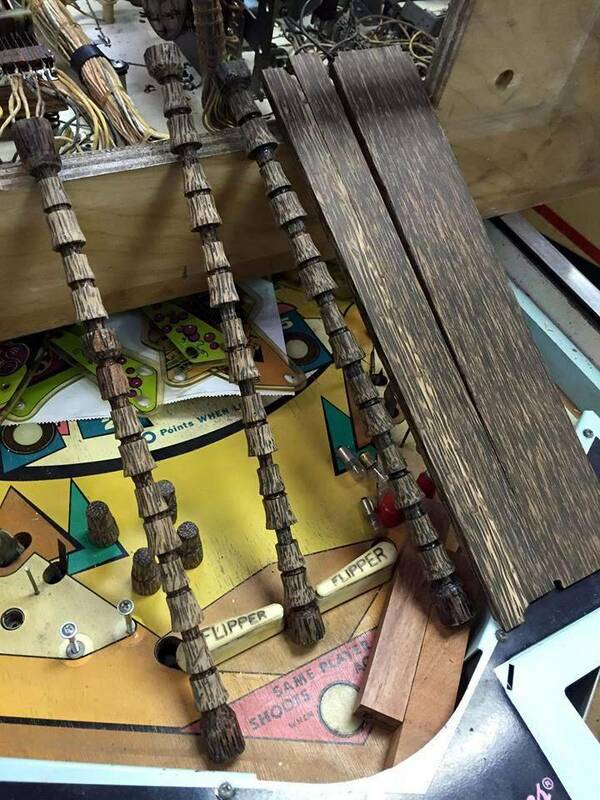 I'm planning on using wood or wood veneers for everything on the cabinet and playfield (no painted graphics) except for black decals for the playfield text. I'm still debating the artwork style for the backglass and plastics right now. 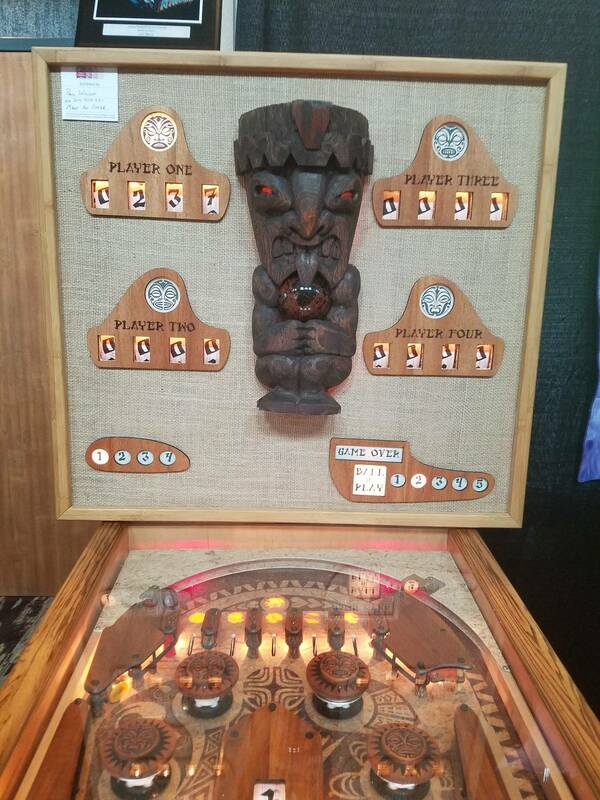 The backglass is most likely going to be a ink painting on rice paper of a beachside tiki hut, and the plastics will either be more ink paintings, or thin carved/etched wood like the caps above. Wow nice...it will really rock if there were holes to let the light through. GL! Those look awesome! I have a POTC and while it sounds like a cool idea, I don't think you would be able to see them back there. The red pops are kind of hidden under plastic and behind stuff, no? The center "faces" of the caps are raised above the outer ring, so the light will bounce off of the bottom of the center and light up the outer ring of the caps. You can see the gap in the 2nd to last photo with the side view. 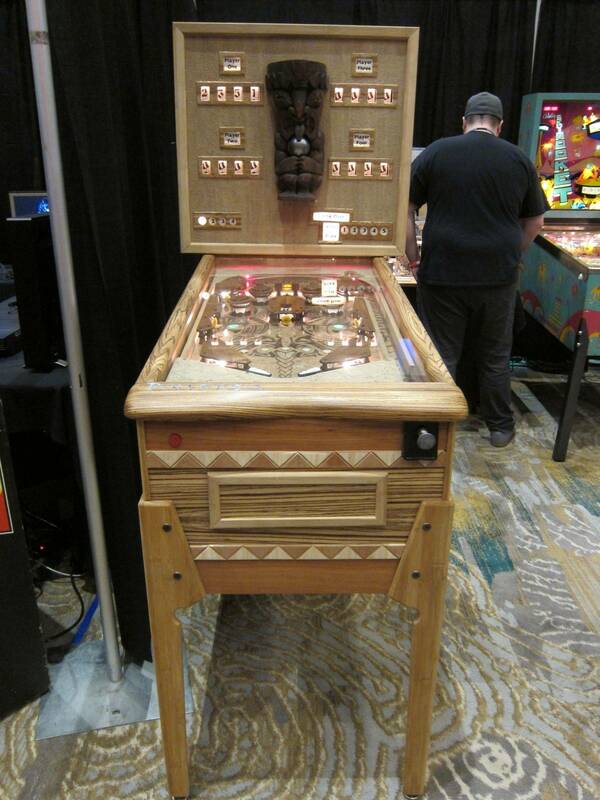 Yeah, I just looked up the playfield layout for PotC and saw that. Ehh, still think it's a cool idea, and will try it out for fun. sounds like the light shining will look sweet very creative. 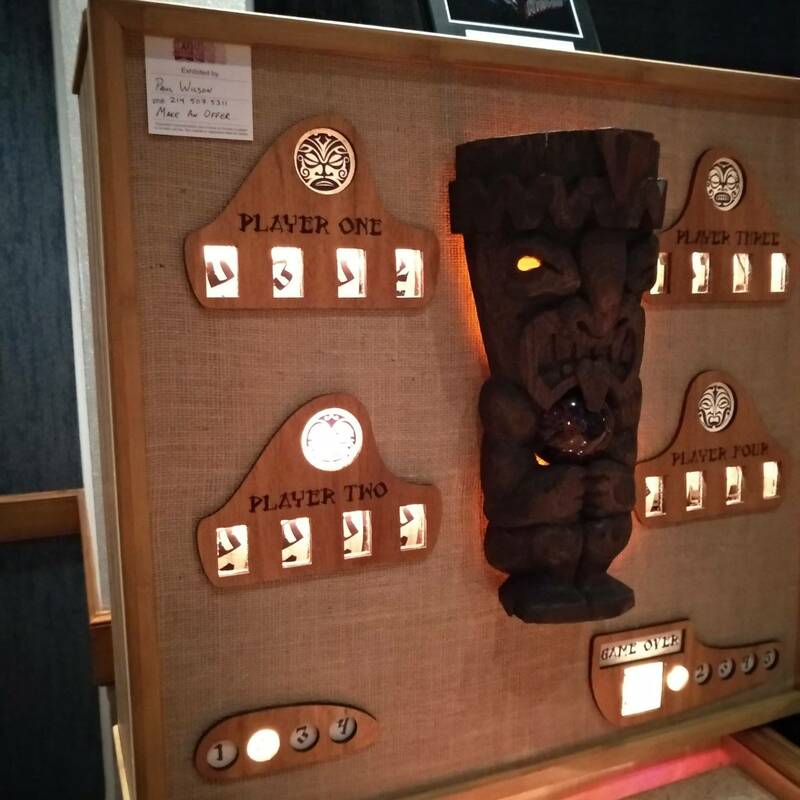 If you wanted to give it a more specific tiki theme, you could always Disney-fi it. Jungle Cruise, or Trader Sam's (https://disneyland.disney.go.com/dining/disneyland-hotel/trader-sams/) or even the original Enchanted Tiki Room. very nice. 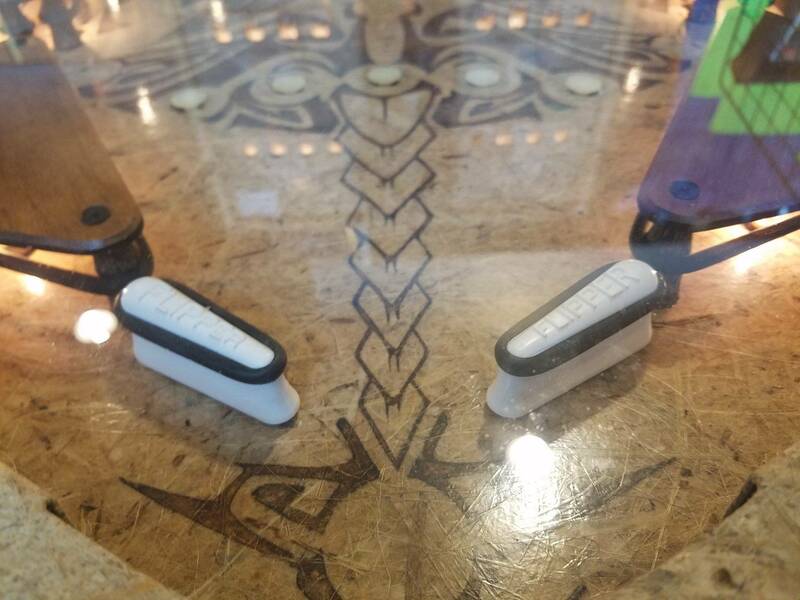 nice choices for the pop-bumper caps with the slightly different designs, but overall the same amount of detail on each one. This is really amazing! 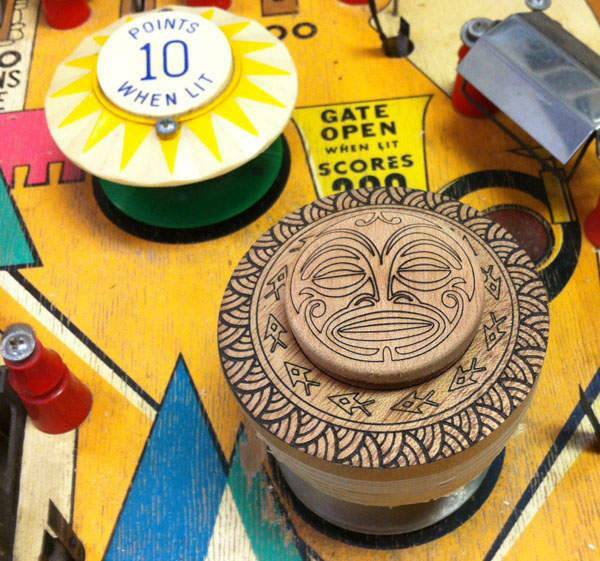 I can't wait to see it finished - I'd love a tiki pinball. Amazing creativity and effort especially for someone new to the hobby. I hope the pf will be cleared. That's pretty cool! 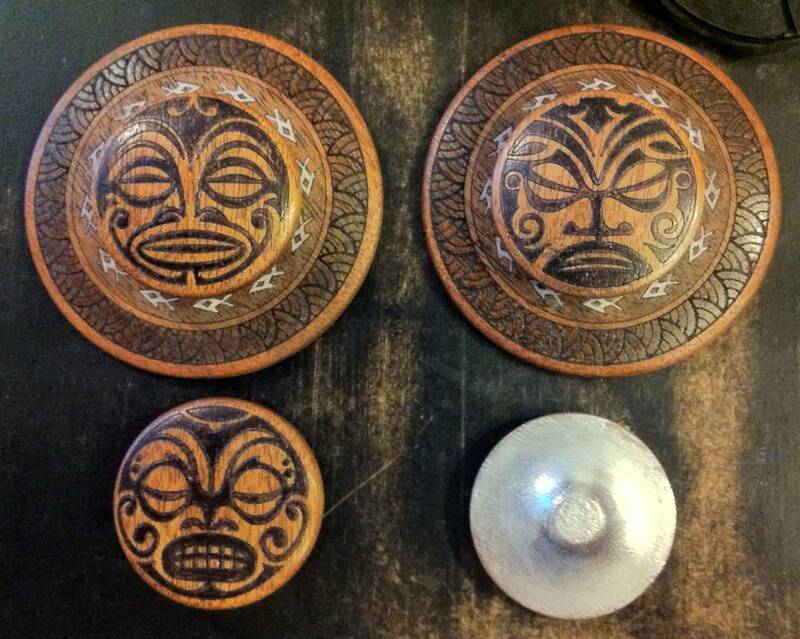 Into the tiki scene myself. Well done! Excellent work, Hardsuit! 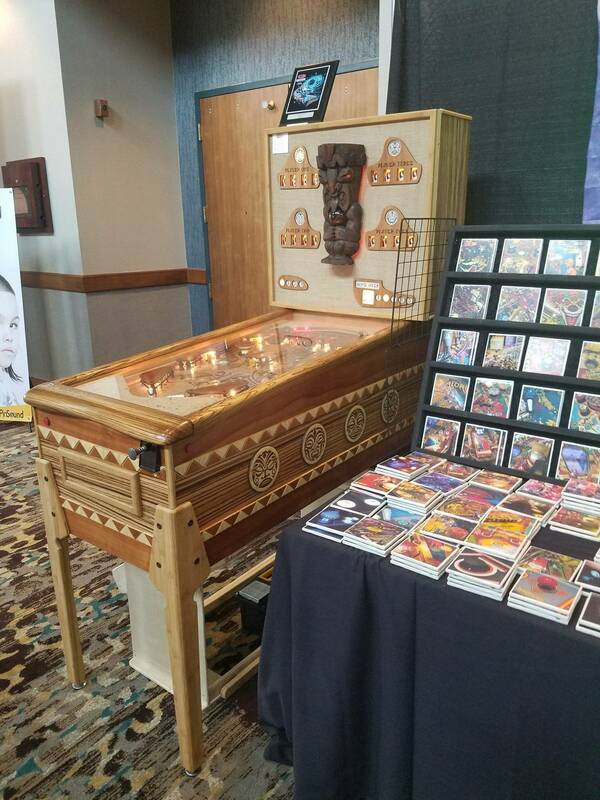 From a fellow woodcarver, I applaud you! Excellent! Really nice original thinking, I love seeing it. 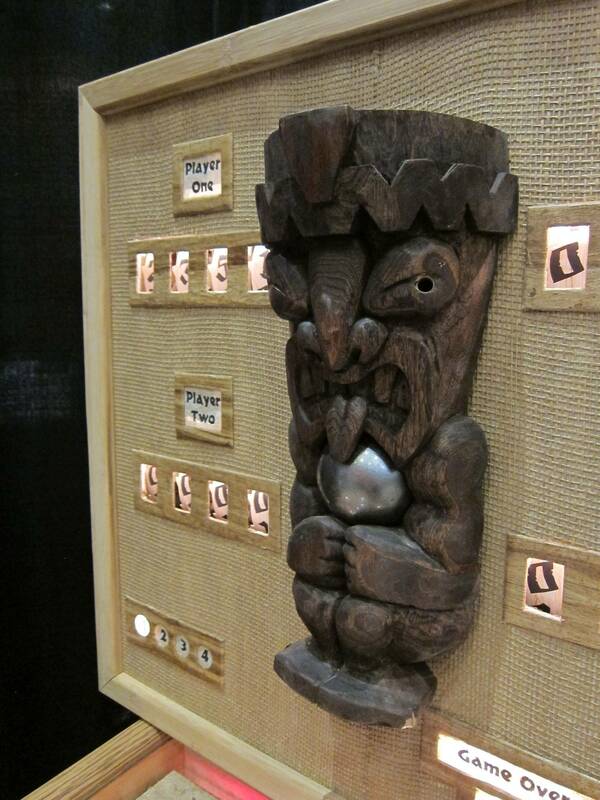 An EM is a perfect canvas for a tiki theme. Looking forward to seeing where to you take this. Really interesting idea. 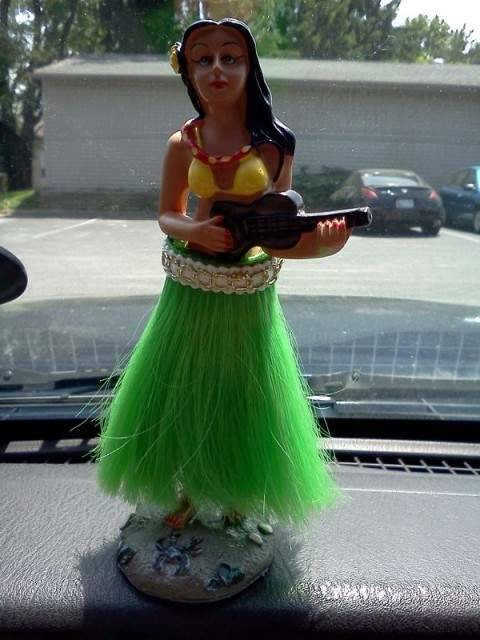 I've always been a big Tiki fan. The only problem with this - I wish I had thought of it! Yeah, I plan on a 2pac clear coat after I get all of the marquetry veneer laid down to my satisfaction. 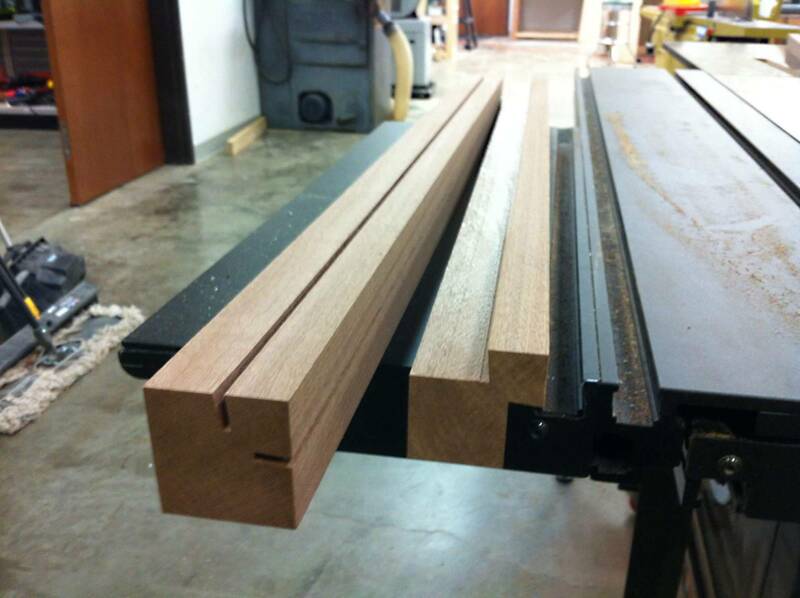 Luckily I have access to a 5' by 10' CNC router at the Makerspace to make cutting the inserts, etc much easier. Yeah, I've seen lots of Shag's stuff. 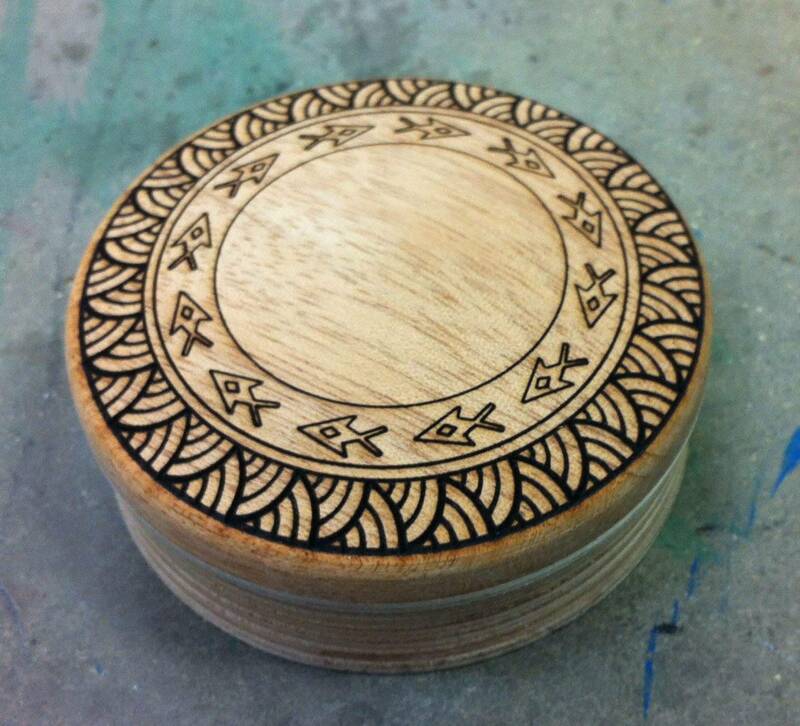 It'd work great for pin graphics, but for this theme I plan on minimal "picture" artwork and mainly use tribal patterns, like you see on the outer ring on the caps. 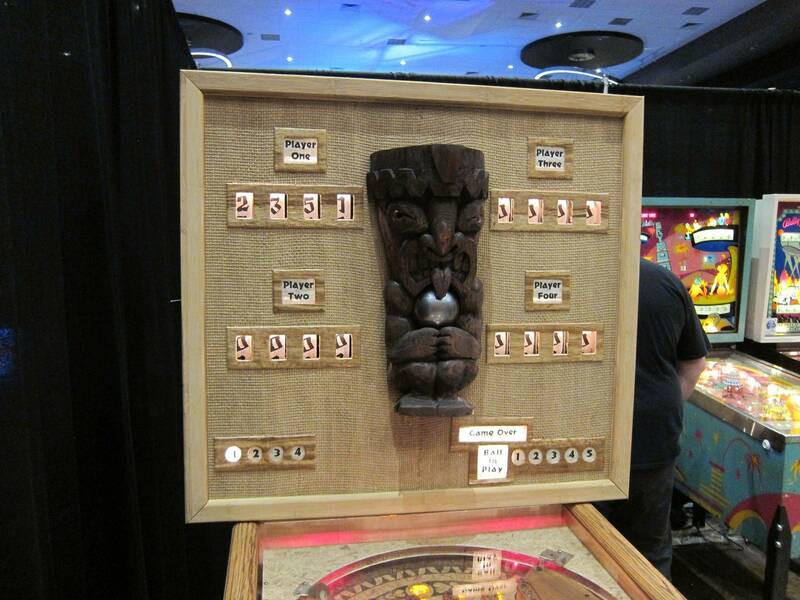 I've been thinking about doing a tiki re-themed pin for years, but now I know I'm not worthy. This is awesome - I can't wait to see more. BTW, my user id "swampfire" is a nod to Doug Horne's "Swampfire Lounge". Looks like I need to go blow up the Ingress portal at DMS again and sneak in to get a peek as well. I don't have a membership but people keep letting us in to look at stuff, lol. 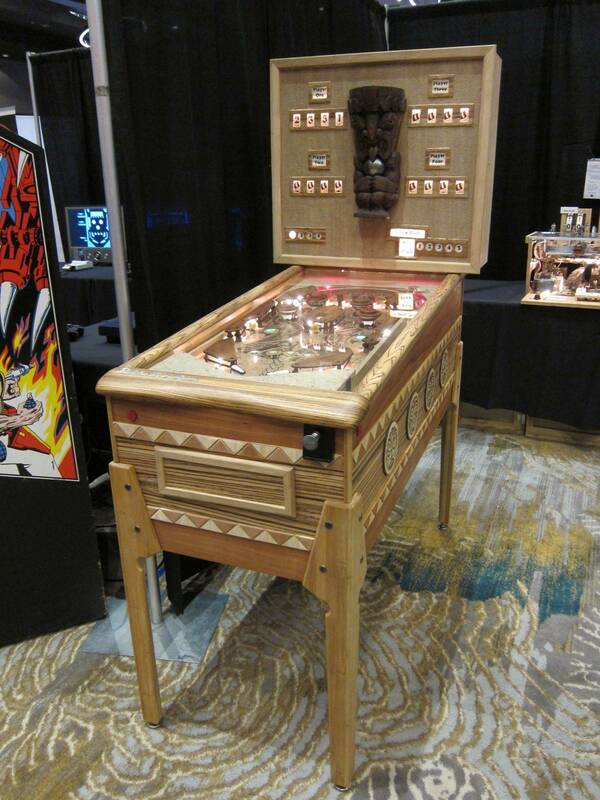 I always thought a Tiki Madness pinball machine would be great. Could have some pretty cool toys. No need to sneak, every Thursday is the Open Tour night for officially scheduled tours, but there is almost always someone to do an informal tours on other days/evenings. We have classes pretty much every night that are usually free and typically open to the general public. I use the term "sneak" loosely. My wife and I ran a league night/tournament at the old location last year (in which I played horribly...Nick's Doozie and Shawn's Elektra put the moves on me...). Finally decided how I'm going to handle the siderails and lockdown bar over the weekend. Grabbed a big (7'x4"x2") board of zebrawood, and am working up a design to create a wooden version of the old Bally playfield glass frame ('72 Fireball as an example) but using a standard sized glass. The biggest design issue was figuring out how to make the lockdown bar removable to allow for glass changes, and I think I've got that problem finally licked. Looking like there will be a number of woodrail design elements in this thing by the time I'm finished with it mixed in with the more modern bits as I find something cool. Got the final lathe and laser passes done on all four caps. 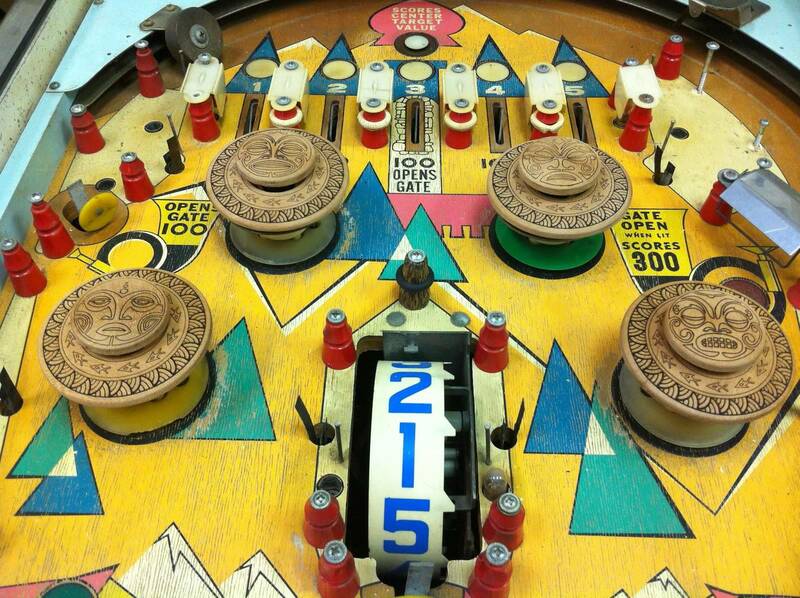 You can also see one of the black palm posts in the center just above the playfield score reel. 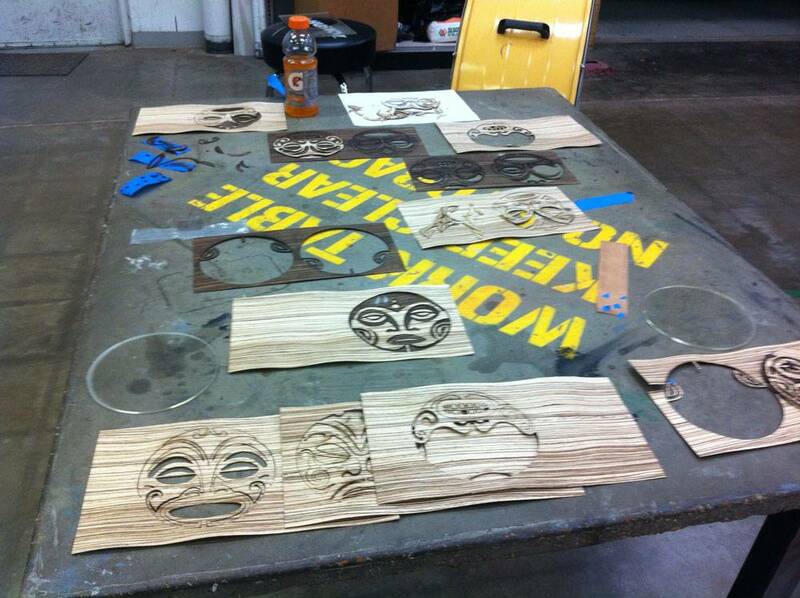 Next up is selective staining, shellac, and silver leafing the underside of the tiki face centers. This is still on the original Student Prince playfield, I'm still doing the art design for the new playfield. I must say all of the VECTORIANS and visitors to our work zone are quite pleased and excited with the progress of this project! Really amazing detail & looks even better in person. 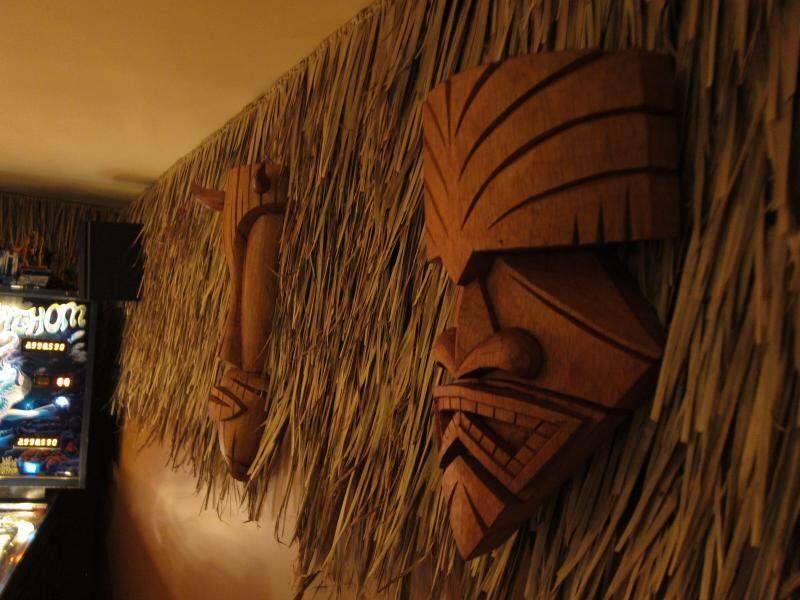 I only wish Trader Vic's hadn't closed in 2010... otherwise we'd be planning a lavish project completion party there. 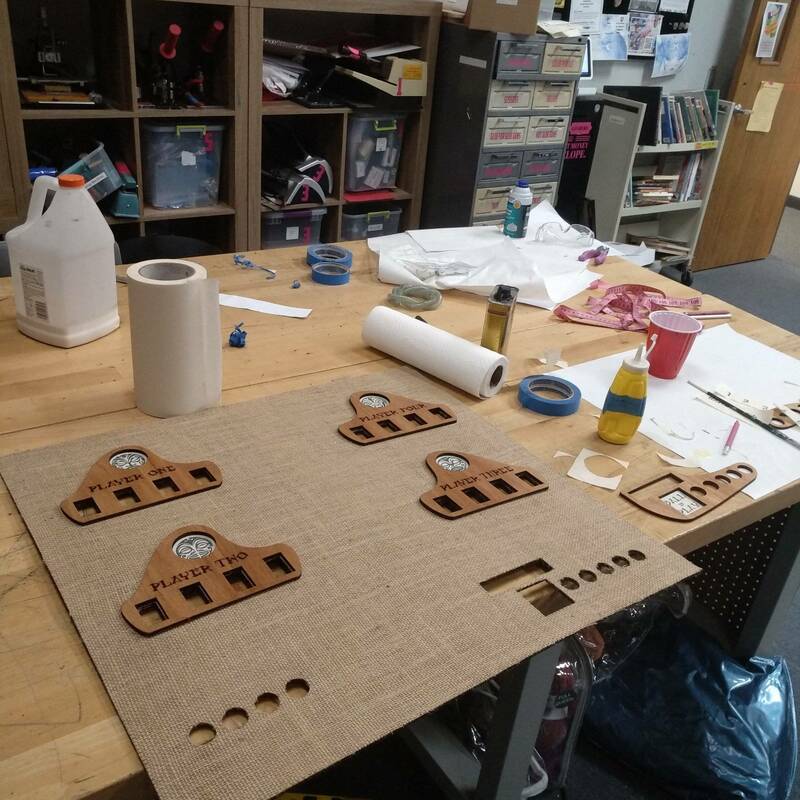 As mentioned, if you will be in the D/FW area this weekend, the Dallas Makerspace will be holding an open house party this Saturday the 12th from 10am-late. 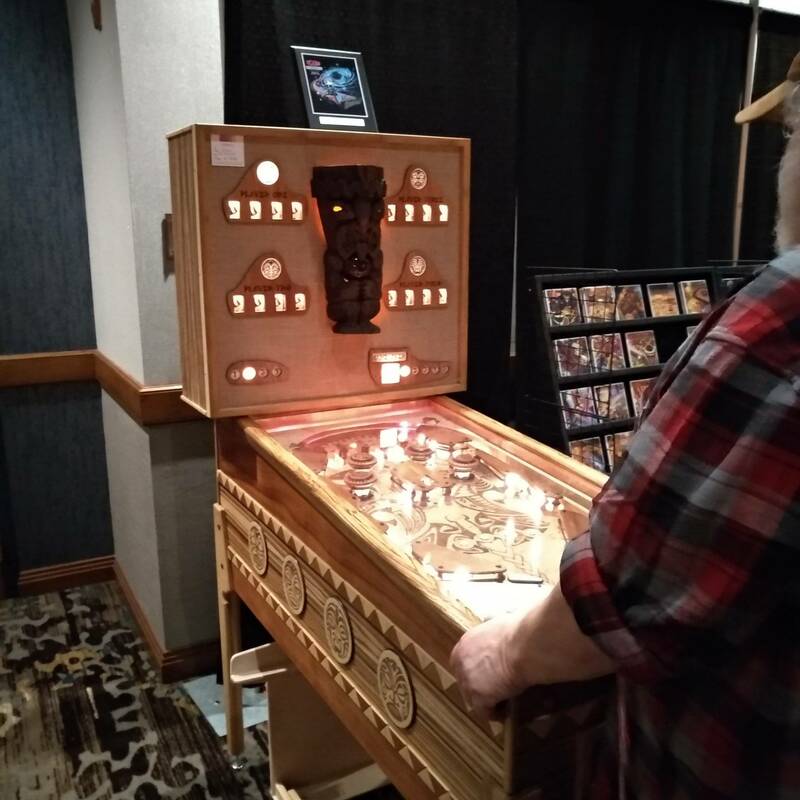 We will have all of our project machines on-site as well as at least 11 others in playable condition. Including a Sinbad SS and EM side-by-side to compare. Also: Robots, RC cars, flying drones, zany art projects, food trucks, etc. Free parking & admission to the geekery. The caps with stain, Rub'n Buff, and shellac applied. I switched to Rub'n Buff instead of leafing for the reflective bottom surface of the center face caps. Same results, but faster and cheaper to apply. 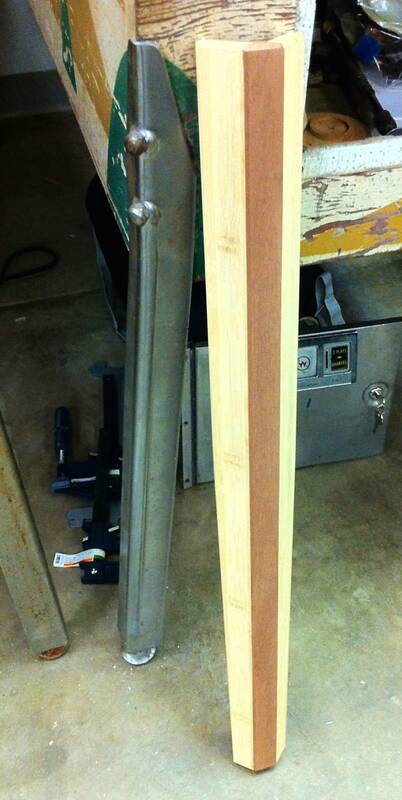 The inner "core" of the leg is sapele (somewhat similar to mahogany), and the outer "fins" are solid bamboo laminate. 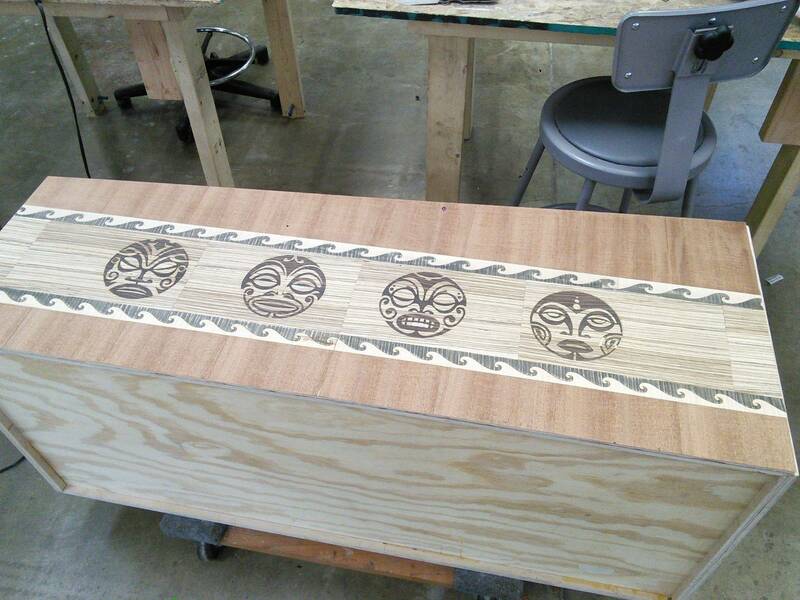 Still deciding on the design, but will be doing some veneer inlay into the sapele of some kind of running pattern down the length of the leg. Interested in selling your Student Prince plastics? 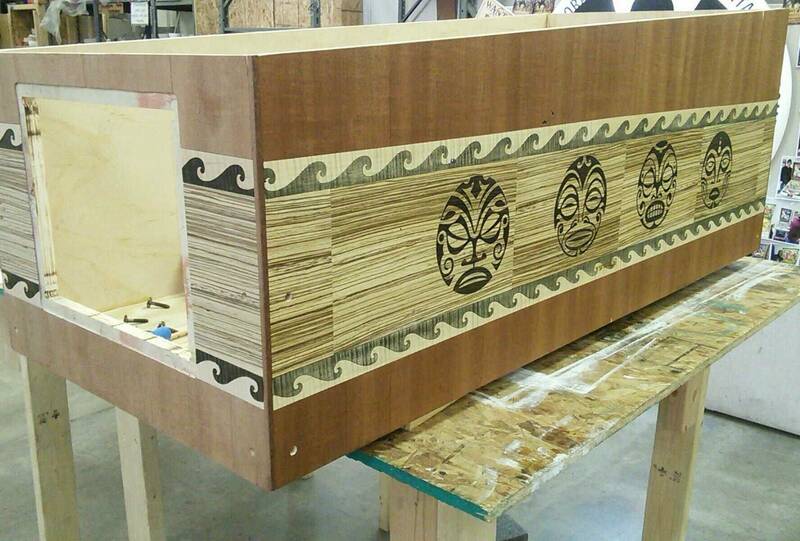 Veneers are mahogany (wide bands at top and bottom), lacewood (the wave patterns[stained and unstained]), zebrawood (the lighter middle stripe), and ebony (the tiki faces). 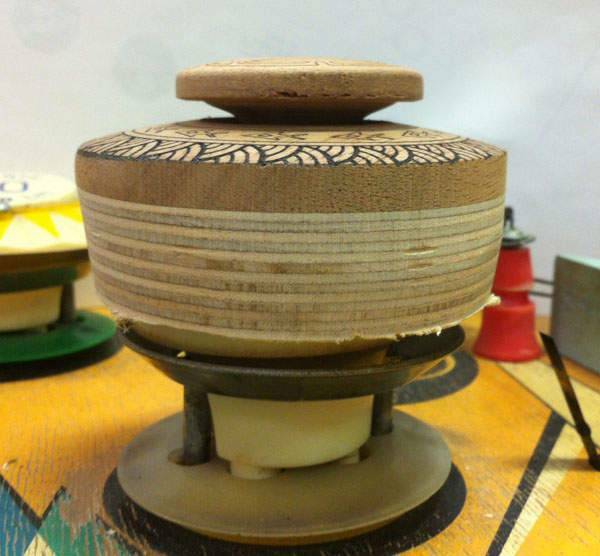 Scale wise, the circles are 5" in diameter. 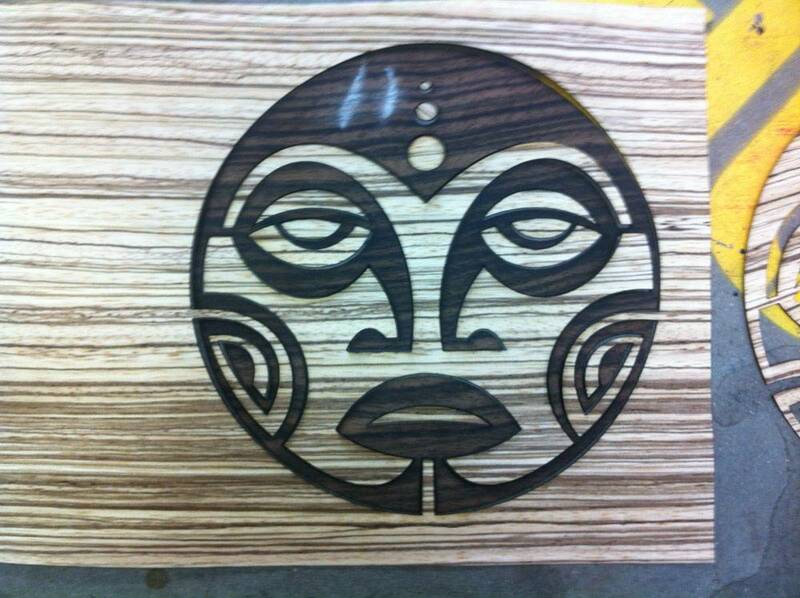 Lighter wood is Zebrawood, darker is Macassar Ebony. 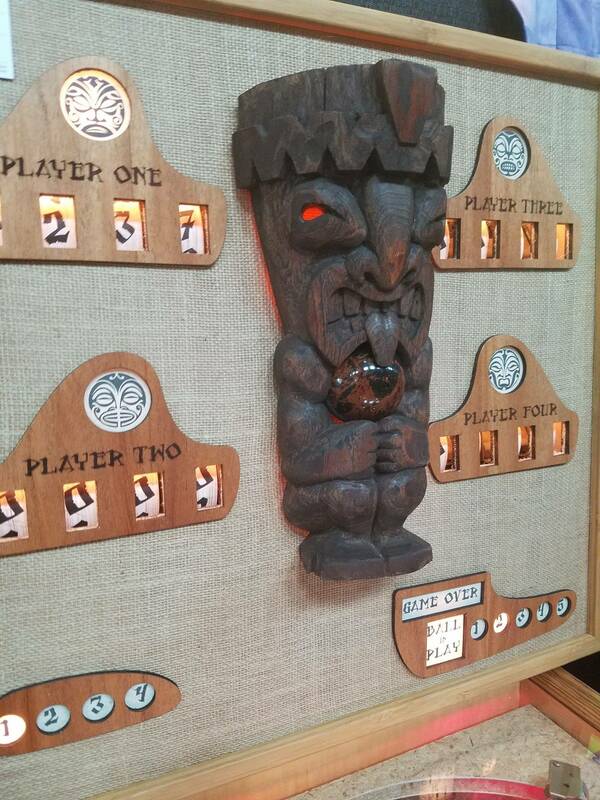 My tiki retheme will be showing up at TPF, but will still be a (playable) WIP. Sooooo much fiddly detail work. 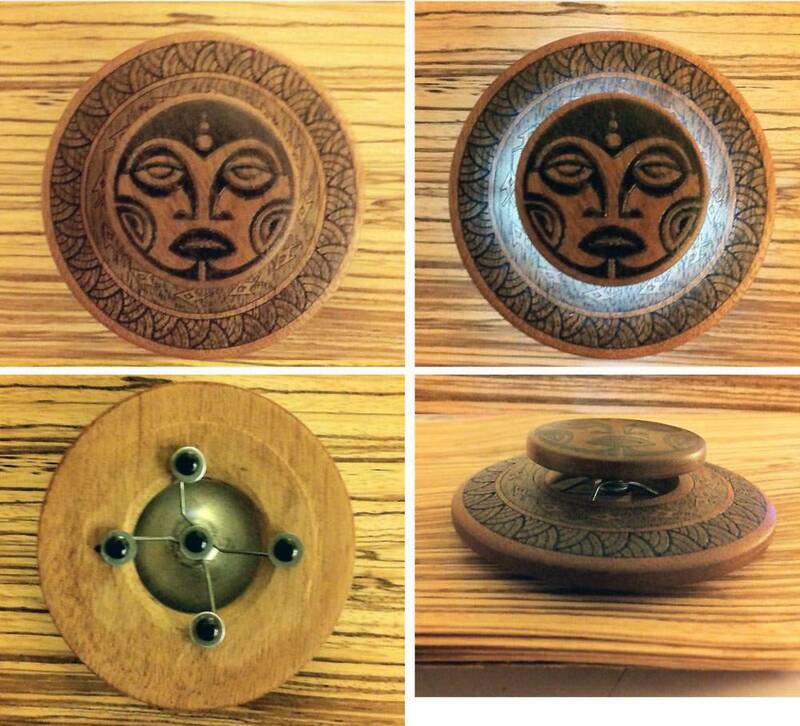 of mahogany, sapele, zebrawood, and bamboo. 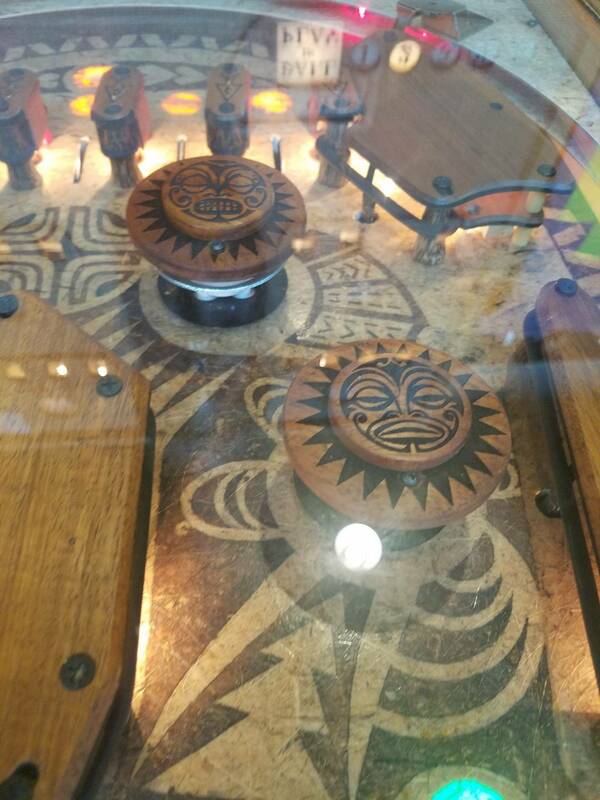 You can see the original Student Prince cabinet to the right of the new tiki cabinet in the first photo. I've got a woody. This is amazing! This is what it looked like at TPF this past weekend. 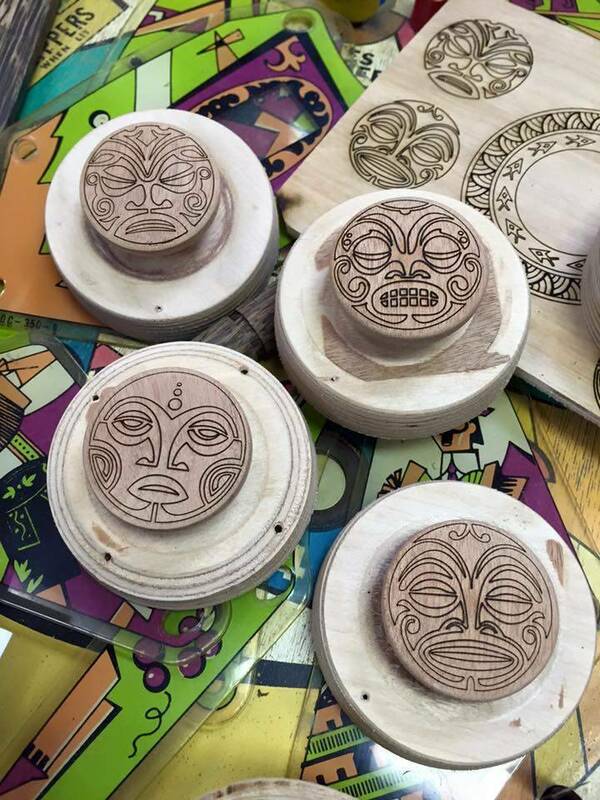 Polynesia works, but man she is cranky. All of the mechs need a very thorough cleaning to remove the decades of built up gunk. 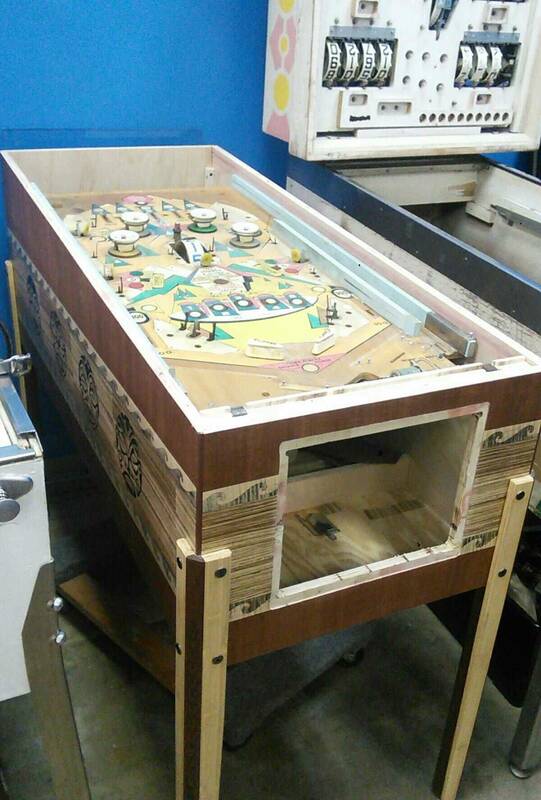 This is the current state of the playfield. 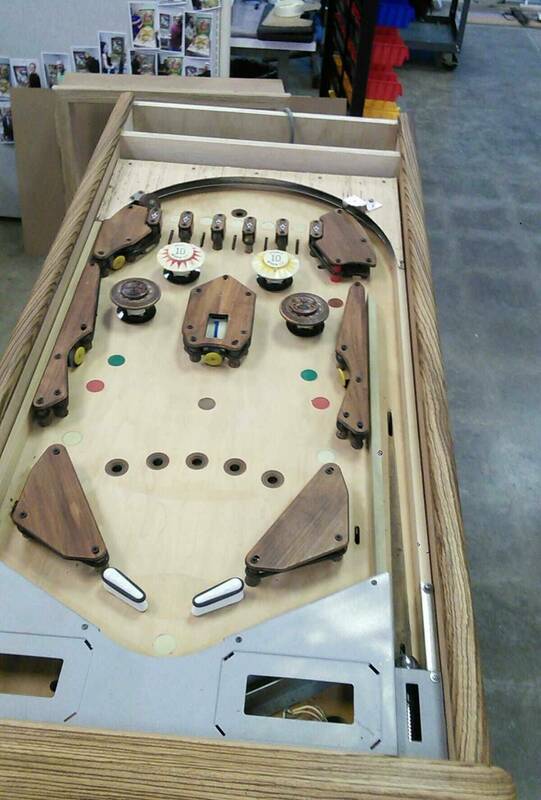 I am really liking the light/dark contrast between the playfield and plastics (or I guess woods in this case...) and will go with that overall look. 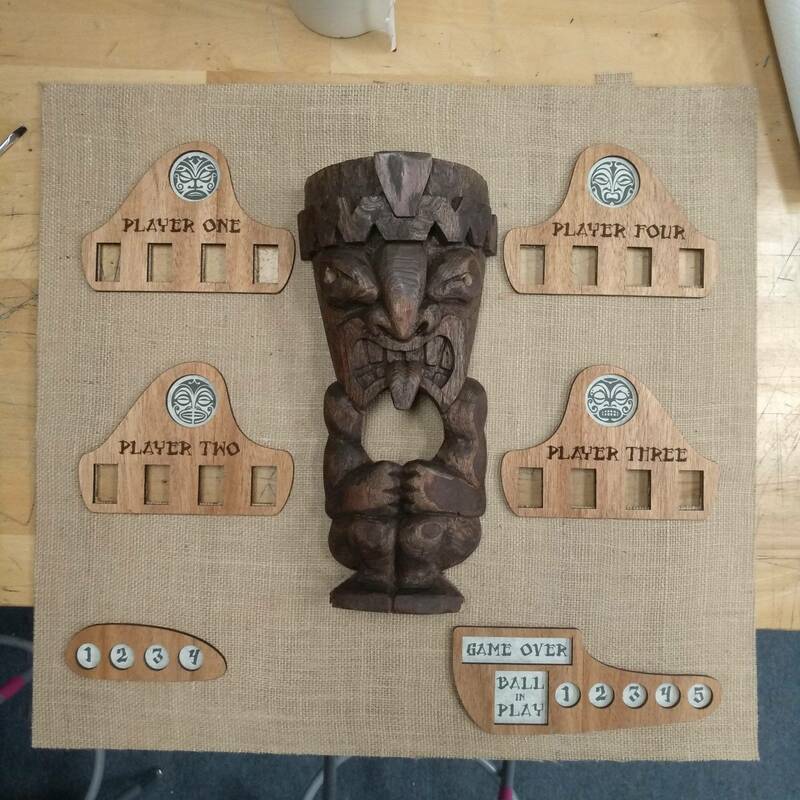 I'm thinking a light bamboo veneer with minimalist tribal line art for the playfield, and some minor detailing/carving/artwork on the woods. 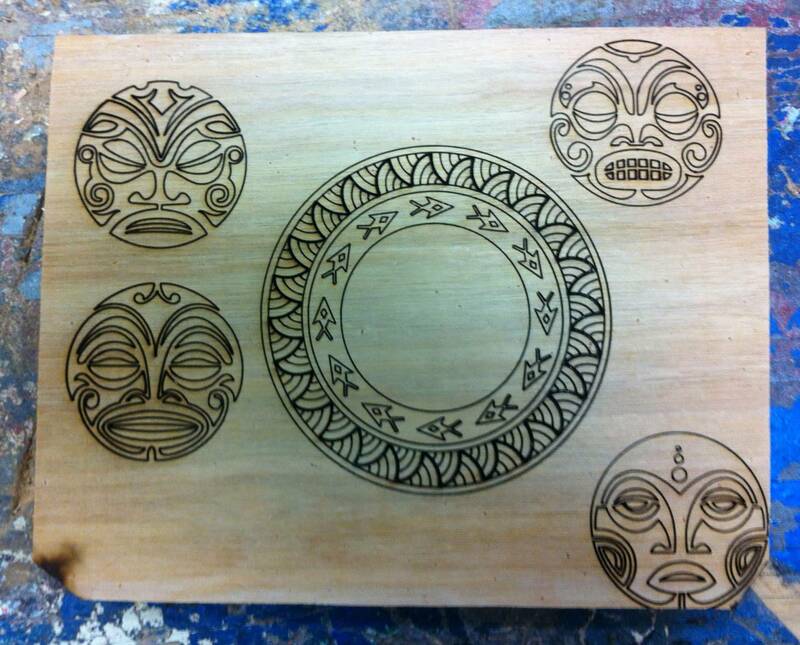 If I can figure out the correct settings for it on the laser I will also incorporate spots of inlaid mother of pearl. 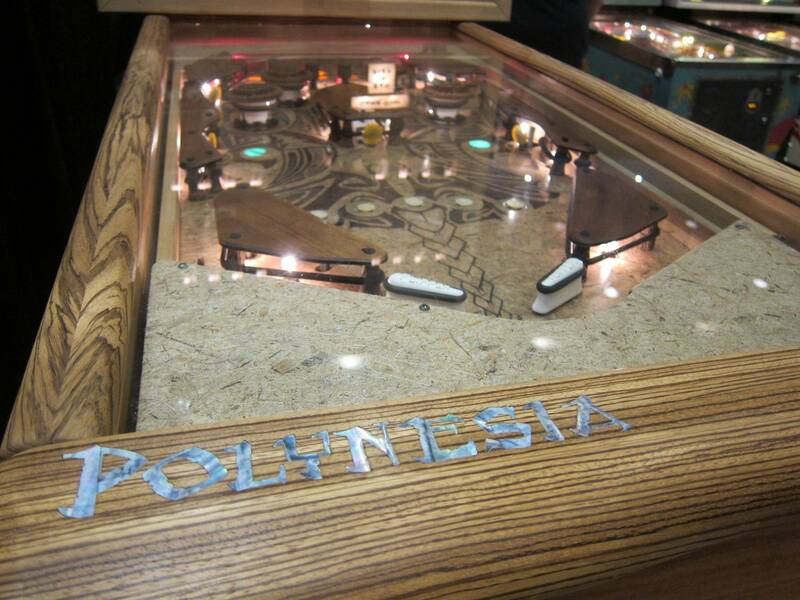 I'm really hoping to have the Polynesia name inlaid into the lockdown bar at the top right corner this way. Whoa! This is incredible. 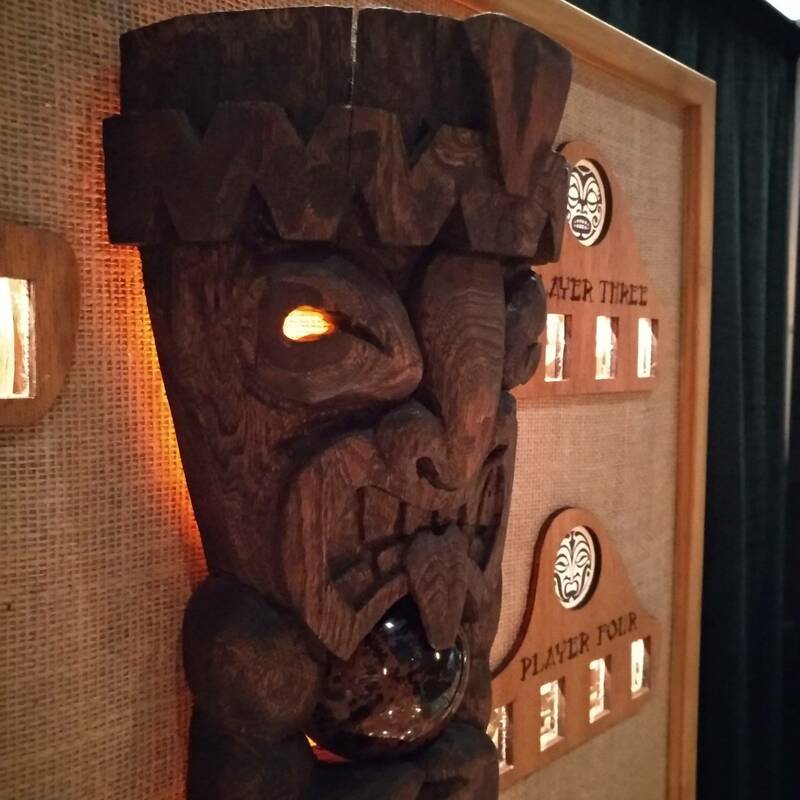 I've been into Tiki for 20-25 years, and have an entire basement full of tikiphilia! (I think my basement pin collection might be on the gamerooms thread?? I forget). This is an excellent project. You need some Martin Denny background music! !